Hot on the heels of the well received Mastercutor (2007) and its live concert set Mastercutor Alive (2008), veteran metal vocalist Udo Dirkschneider keeps a good thing going with Dominator, a solid disc of melodic metal filled with hooks and heaviness. Being in the business for more than three decades, Herr Dirkschneider is strong as ever with no signs of slowing down for the golden age of retirement. Dominator hardly reinvents the wheel that Udo started with Accept in 1979 and continued with a solo career begun in 1987. His musical style has always been on the German side of the NWOBHM phenomena. UDO efficiently blends melody, begriming with Dirkschneider's sandpaper vocals, with a steady metal groove that also remains melodic, but also heavy and formidable without succumbing to the harsh brutality of modern metal. It's refreshing to hear the melody, harmony, and heaviness of Dominator, Infected, and Doom Ride knowing that you can still bang your head without being bludgeoned bloody by some idiot trying to start a mosh pit. Even with predictability of the metal ballads, Stillness of Time and Whispers in the Dark, or the cheesy metal metaphor of Heavy Metal Heaven, Dominator still rings of true melodic heavy metal. And just to trip you up, Dirkschneider throws a simple (and unexpected) rock 'n' roll curve ball on Devil's Rendezvous. 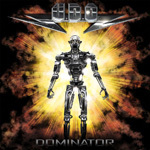 With Dominator, Udo Dirkschneider's UDO continues his recent success with another fine platter of traditional heavy metal. It's an entertaining and refreshing dose of melodic metal over against the languishing brutality of modern metal trends.